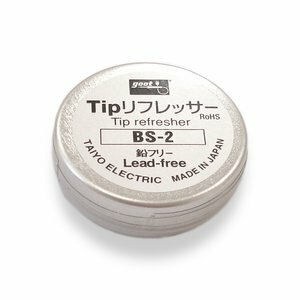 This tip refresher is used for fast and effective cleaning of the soldering iron tip, which already can not be cleaned with a sponge or napkins. Optimal tip temperature for refreshing it is from 300 to 360˚C. Dip the hot tip into the tip refresher. Apply solder to the tip. Then carefully clean it with a moist sponge. If the tip is still unclean, repeat steps 2 and 3 above. WARNING! Make sure you completely remove the tip cleaner from the tip before starting to solder PCBs. If the tip cleaner remains on the tip, it may stick to the PCB and corrode components.